In my very first article with Catavino, I described an amazing experience lunching on fresh grilled fish along the Portuguese coast, an event I eagerly anticipated for weeks. Today, I can still say that I dine out on peixe grelhado every weekend, and I look forward to it as much, if not more, than I did before. Clearly, I was hooked from the start! The concept of grilling fresh fish whole in sea salt is a foreign concept to many of us in the States. Culturally, most North Americans have been brainwashed to cringe at the thought of eating anything that looks like it did when it was alive, fish included. But once you eat a fish in its entirety, like we do every weekend here in Portugal, it will be difficult to want it any other way! Hence, I took some time to delve into the Portuguese fish culture, beginning with a local fisherman mending his nets. On a Sunday trip to the coastal city of Setúbal, I spent over an hour chatting with Carlos Manuel Jorge Cardoso, who has fished the high seas for over 50 years; a concept I can’t even imagine. Read full interview on Portuguese fish culture here. Dourada * Gilthead Bream, probably the most common fish to appear on lunch counter specials during the week and as a main feature on the weekend. Very light, pleasant flavor, and a great first time fish. Peixe Espada* Scabbard fish, not to be confused for swordfish, as it looks much more like a giant monster eel instead. The flesh is light, white and incredibly flavorful. Grilled in small, flat pieces rather than whole, it’s delicious. Corvina * Croaker, can be found on lunch counter specials during the week. Grilled in postas, light flavor. Robalo** European Seabass, slightly more flavorful than Dourada. The flavor is a bit stronger than Dourada but still light with tender flesh. It’s also a good first time fish that’s typically available in small, or large sizes, that can be shared between two people. Linguado **/*** European Sole, commonly found both grilled (with butter because it doesn’t have enough fat for grilling) and fried. It’s more expensive when out of season. Choco * Cuttlefish- Not really a fish, as it’s from the squid family. The best way to eat Choco is fried (famous in Setúbal) but they are also tasty when grilled or chopped up and served in their own ink! Sargo-Alcorraz * White Sea Bream is a medium sized with white, firm flesh. Pargo ** Common Sea Bream, large in size with white, firm flesh. Besugo ** Sea Bream, small with soft, white flesh and a very pleasant flavor. 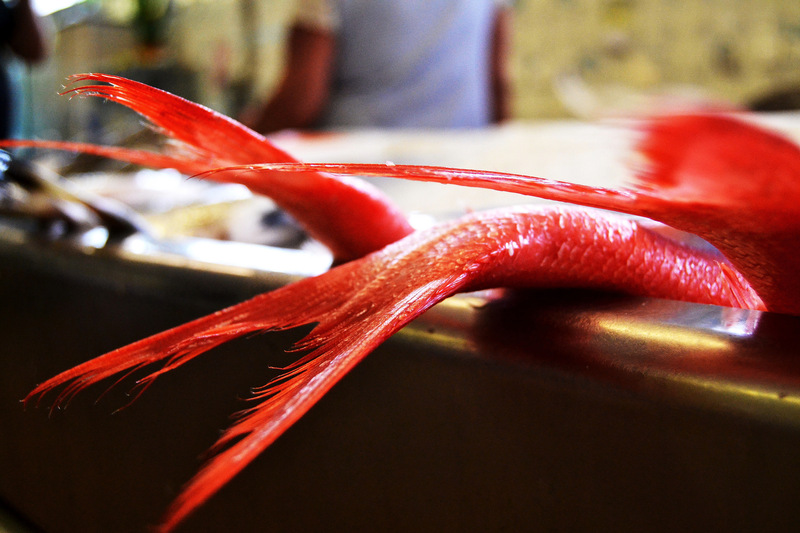 Salmonete **/*** Striped Red Mullet, small but really flavorful, but can be quite expensive out of season. Only worth ordering when it’s in season (winter). 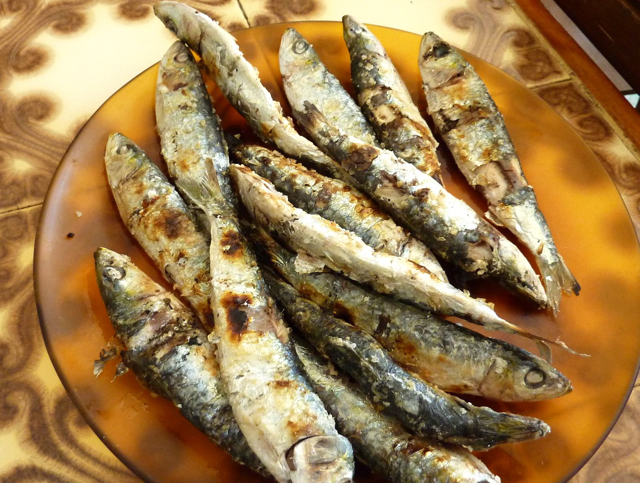 Sardinha * Sardine, the cheapest and strongest flavored fish found in Portugal and most associated fish in Portuguese culture. They are fished year-round but the best season to find them are “in the months without an “R” (May-August). Traditionally they are eaten whole over a fresh piece of bread, as the spines are small and thin enough to eat and the flesh is soft. Sardines are part of the blue fish family which makes them more nutritious than white fish – not that it really matters when you’re tasting through Portuguese delicacies! Carapau * Mackerel, almost as cheap as sardines but even easier to find than the latter. Additionally, they aren’t nearly as strong in flavor, but still have a distinct and tasty character. Carapau are generally served with a molho espanhol “spanish sauce. made from onions, garlic, red wine vinegar, paprika and cilantro. Joaquinzinhos* Very small Carapaus that are fried; these are illegal to fish but you will find them on a couple restaurant menus (as specials) throughout the year. Pescada ** Hake, the cheapest quality fish, and is usually found on menus on Mondays when there is little fresh fish available. The flavor may be bland, but it’s a fishy bland, with a very fishy smell. It’s usually boiled or fried in postas, which means the fish is cut into chunks lengthwise, leaving the spinal bone exposed in the middle. 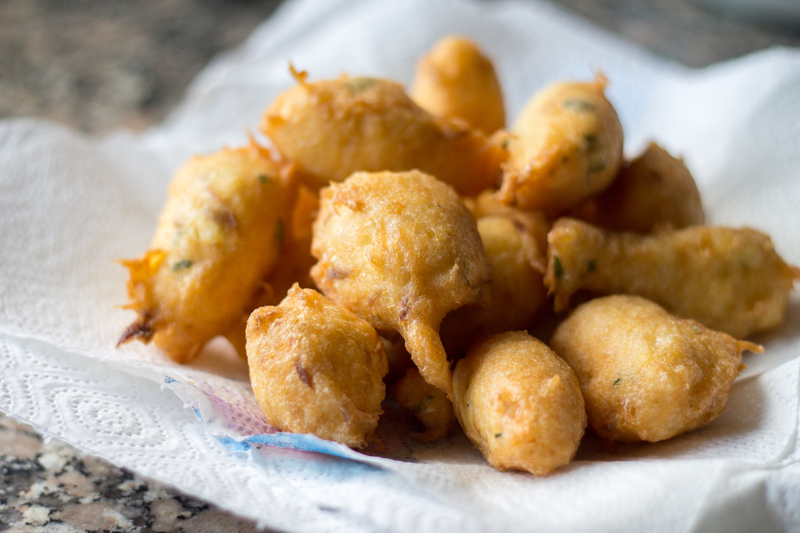 Bacalhau **/*** Salt Cod is hardly ever found fresh in Portugal, but is prevalent in its salted form everywhere. Normally it has a strong, salty flavor, but can be toned down in certain preparations. For a milder dish, try Bacalhau á Bras, my favorite! Salmão * Salmon, grilled in postas. Atum */** Tuna, never grilled in Portugal, more commonly stewed in a tomato and onion sauce. If you ask for a rare tuna steak, or even a cooking temp. to begin with, people will look at you strange here! Garoupa **Grouper, fried, grilled or used in popular dishes. Tubarão/Cação **/***Shark/Dogfish, usually fried or grilled on skewers. Pregado: *** Turbot, grilled or boiled. Espadarte *** Swordfish (the real one! 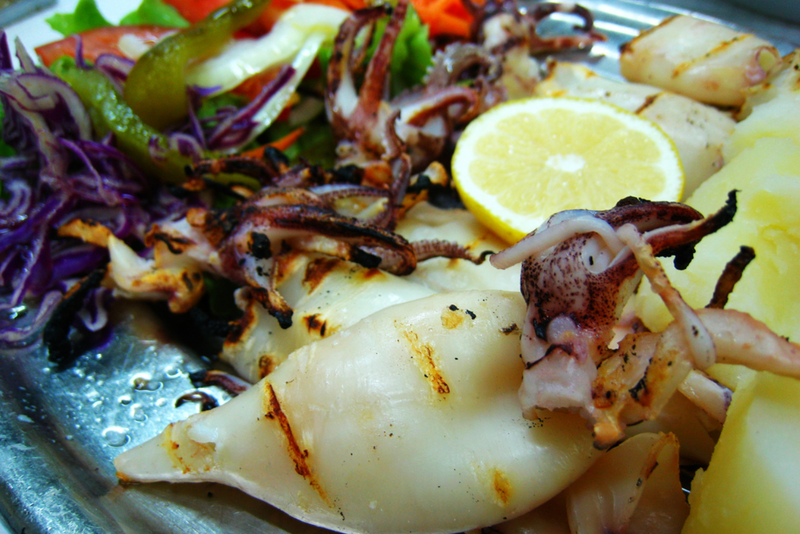 ), grilled in postas. Learn more about Portugal’s vast fish culture with our article on Tips on how to Choose Fresh Fish and How to Butterfly and Grill Portuguese Fish. We also have a heaps of Portuguese Recipes for your to whip up at home, and plenty of reasons for you to come visit us to experience Portuguese fish first hand on our Food and Wine Tours throughout Portugal!